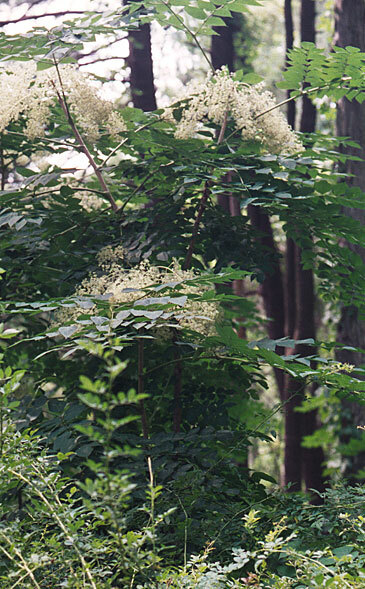 This is a large shrub or small tree that is 8-30' tall at maturity, forming a long narrow trunk and either a sparsely branched or unbranched crown. The trunk is up to 6" across, circular in circumference, and more or less spiny. Trunk bark is light gray or light brown and relatively smooth, but becoming increasingly rough with age. The spines are relatively stout, but sharp, and they are often arranged in curvilinear patterns around the surface of the trunk. Alternate compound leaves occur toward the apex of the trunk and the apices of any lateral branches; they are widely spreading. These compound leaves are 2-4' long and 1¾-3½' across; they are mostly bipinnate, although some leaves are partially tripinnate. Individual leaflets are 2-3½" long and 1½-3" across; they are narrowly ovate to broadly ovate in shape, while their margins are serrated. The leaflet bases are narrowly rounded to rounded and often asymmetric, while their tips are somewhat elongated and narrow. 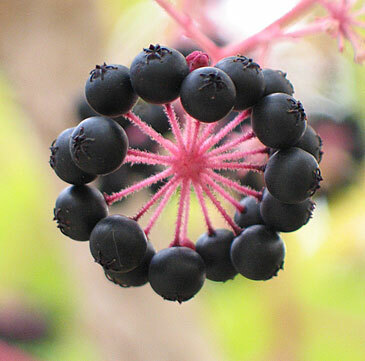 Flowers form in small clusters about ¾-1" across and globoid in shape, consisting of 12-20 flowers and their pedicels. Each flower is up to ¼" long, consisting of 5 triangular petals that are white, a short-tubular calyx that is light green. The blooming period occurs from mid- to late summer. The flowers are fragrant (reported to be lemony). 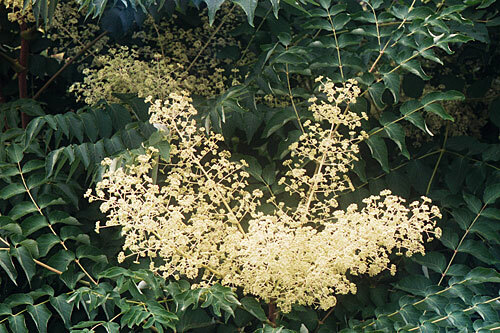 Afterwards, the flowers are replaced by small berries. At maturity during the autumn, these berries are about ¼" long, ovoid-globoid in shape, finely ribbed, and either dark blue or black. These berries have thin fleshy interiors and they contain 2-5 flattened seeds. Habitats include upland woodlands, lowland woodlands, wooded slopes, wooded ravines, bluffs, woodland borders, wooded areas along streams, savannas, and thickets. Devil's Walkingstick prefers areas with a history of disturbance from occasional wildfires, logging, etc., as this reduces excessive shade from overhead canopy trees.